Mahimahiu, Kenya (Thomson Reuters Foundation) – Not many women are clean energy entrepreneurs in Kenya. But poisoned chickens turned Lydia Waithera into one. So, on the advice of other farmers, she turned to briquettes made of compressed waste materials from sugar and molasses production. The long-burning briquettes worked – even relieving her of the middle-of-the-night drudgery of trudging to the chicken house to stock up the charcoal fire. 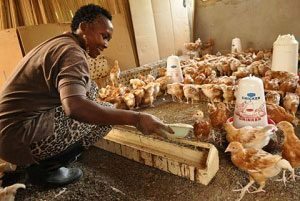 Within two years, as her chicken business grew, she needed 200 bags of the briquettes a month. That’s when she began looking into making her own, to save money. Four years later, after receiving business training and a loan, she produces a ton of briquettes daily, with a hired staff of four. Her initial $1,200 investment has become an $18,000 business, she said. “I discovered that it was a lucrative venture and I’ve never looked back,” she said. A lack of capital and clean energy skills among Kenyan women has so far contributed to men dominating the country’s renewable energy jobs and businesses. Slowly, however, women have started pushing open the doors that once barred them. To help transform her briquettes company from a spark of an idea into a successful business, Waithera joined a mentorship program run by the Global Village Energy Partnership (GVEP), an organization that focuses on increasing access to energy in developing countries. In 2014, GVEP also helped Waithera get a $3,500 loan from a local financial institution to expand her business. Now “my target is to produce 3.5 tonnes of briquettes daily and employee six people”, she said. Despite her track record and training, however, Waithera has faced resistance building her business due to perceptions in Kenya that renewable energy is not a field for women. “When I was looking to buy machines, manufacturers assumed I’d been sent by a man and would ask to talk to the ‘owner’ before they would explain how to use the machines,” she said. “But the situation is changing.” Even so, she said, financial institutions are still reluctant to back women entrepreneurs or recognize green energy ventures as viable investments. There are other problems as well, including a lack of skilled labor and poor quality locally made machines. “Good machines have to be imported and are costly,” she said. All of these issues could be addressed, Waithera said, if universities and technical research institutions collaborated with renewable energy entrepreneurs to encourage training in green technologies, especially among women. That would give a boost to the sustainable energy industry while also improving the quality of its products, she said. Sammy Kitula, capital access coordinator at GVEP, agrees. “It is a pity that only a few Kenyan universities are focusing on renewable energy. (With) the appropriate technology and training, more women entrepreneurs could be brought on board,” he said. Women already play some key roles in Kenya’s renewable energy sector. While designers and technicians are predominantly male, women largely are the ones tasked with selling products and manufacturing some vital parts, such as the linings for a new generation of greener wood stoves. Kitula said several non-governmental organizations are working to guide women into green businesses through mentorship, networking and help with accessing funds. His organization links women green energy entrepreneurs with financial institutions by offering loan guarantees and asking the institutions to lower interest rates, he said. And the Ministry of Energy runs an initiative to offer training for women at its energy centers, he said. According to Kitula, these efforts are now resulting in increasing numbers of women signing up for training and seeking start-up capital for renewable-energy ventures. Waithera urges Kenyan women to grab clean energy opportunities, saying there is a lot of money to be made. “There is an insatiable demand,” she said.